We became Zachary Quinto fans on Season 3 of 24 when he appeared as Adam Kaufman, computer analyst and Chloe’s nemesis. 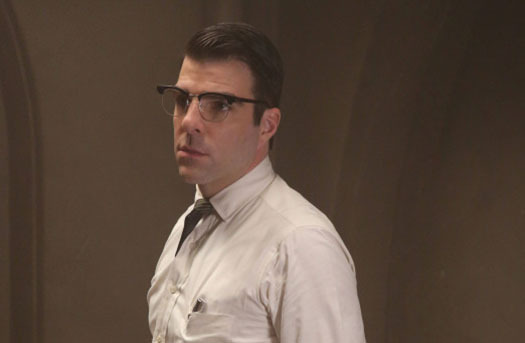 And while we admittedly didn’t watch Heroes, his turn as the serial killer Skylar got him rave reviews and earned him the gig as Spock in J.J Abrams Star Trek. So we were excited during Season 1 of American Horror Story to see Zachary back on out TV sets. And while we loved the first installment of the series, we were slightly disappointed to not see more Zachary. Well this season, creator and producer Ryan Murphy has certainly changed all that. The actor is back and not only has a huge role as Dr. Oliver Thredson, but as it turns out he is also the scariest monster of them all — Bloody Face. In a recent conference call interview Zachary discussed Dr. Thredson, Bloody Face and crossing lines. Watch American Horror Story: Asylum on Wednesday nights at 10 p.m. EST/9 p.m. Central on FX.